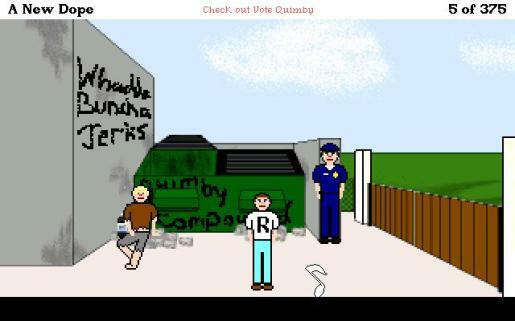 The guitarist for the unpopular rock band, Vote Quimby, has been fired and no one but you would be so stupid as to actually jump through hoops to get the job. For the record, I finished this game in 2006, but I couldn't ever get it to upload, so I thought I would post it for those of you who never played it. I hope everyone likes it. By the by, the interface is supposed to be pretty easy, so anyone with ANY experience with old school adventure games can skip the intro sequence. Everything you need to know is included in a pdf file that comes in the zip.